The issue of parental controls and the Active Choice Plus system that is rolling out and occupying many online column inches can be a very divisive topic. All too often critics of plans for parental controls, particularly those who see the controls as a backdoor roll-out of Internet Censorship are side lined due to lobbying pressure from special interest groups. Thus it is interesting to read the research from Ofcom into Internet Safety Measures and what strategies parents do or don't use to safeguard their child's welfare. The research includes questioning of some 1600 children and 2300 parents for the 2013 data, and collates data from surveys in previous years. For those readers who have children and are fairly Internet aware themselves the strategies of other parents will come as no surprise, particularly the aspect that parents want to balance rules and boundaries with trust and freedom. Centuries of parenting has generally shown that too heavy handed restrictive techniques can actually backfire, and this is especially true for teenagers who do not always see eye to eye with parents. The headlines around this research generally reflect the interests of the body publishing their comment, so the DCMS which is backing network level filters, leads with 'Parents unaware of internet filters', when the reality from the research is that of those parents who did not have some form of parental control system 1 in 8 did not know they existed or how to install them. Figure 17 reproduced below shows another view, that for younger children parents generally feel they know enough. This raises questions of why is the pressure being exerted on broadband providers to implement a system where all new customers have to make the choice to have the filters on or off, with the default being that the system will be on if people do nothing. It seems to be forgotten that the majority of households actually have no children in them. The sources for where parents seek information on child safety online is sober reading, and shows that the age old system of information from schools and friends and family are still the key sources of advice. 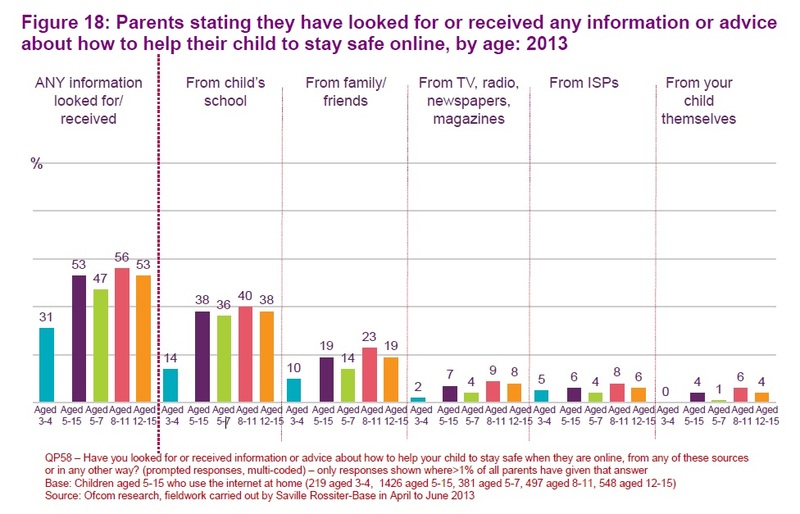 Less than 1 in 20 are described as using special interest groups e.g CEOP, GSO - Get Safe Online, UKCCIS. The small showing for information from an ISP may be partly down to that previous parental control packages were software based and often had their own help systems, the increasing roll-out of network level controls could increase the contact with broadband providers, with resulting increases in call wait time possibly. Another issue can be the way some broadband providers will only communicate with a nominated account holder, which if that person is away from the home may complicate things. At the end of the day the new network level filters are a useful additional tool for parents, but they are a fairly blunt instrument particularly for households that have a mixture of young children, teenagers and increasingly common adult offspring still living at home. This mixed age scenario may see a parent either spending time everyday as a network admin, or simply turning off the controls due to the hassle of over blocking. One aspect of the blocking not covered very frequently is the way apps on iOS and Android devices simply wait for protocol timeouts or do not understand the blocked request, the fact that the Internet is more than just web browsing is all too often overlooked. The population of this country is what? - 60M? Of which probably are a fifth are pensioners. That leaves 48M eligible for casting an opinion. 1600 children and 2300 parents does not, on the population as a whole, sound like good argumentative statistics to me. I am quite sure that the millions of grandparents most of which will be pensioners have a legitimate opinion. For example what happens when the grandchildren are around the grandparents house for example? Do the grandparents have no legitimate opinion on how internet access should be restricted? The answer to mixed age scenarios is of course VLAN's and multiple SSID's with the blocking done at the local router. Though I guess you might be able with pppoe on FTTC connections to pass the VLAN tags through to the ISP. You can do it with a Draytek 2860n for example, but the subscription at £40 a year for access to the filtering list is rather pricey. Or, perhaps somewhat more simply, more than one user profile?